Sergio Garcia stays steady and grabs the win at the Thailand Golf Championship, shooting a last round -4 under par 68 for his winning total of -22 under par. Sergio and Trophy / Getty Images Sergio with girlfriend Katharina Boehm on his bag at Amata Spring Country Club collected his first this year, the last victory coming at the Johor Open, an Asian Tour event in Malaysia last December. Sergio was happy with his amazing week's work; "It was great, an amazing week, I'm very, very happy and I can't wait to go back home to Switzerland and kind of sleep on it a little bit. I knew Henrik was going to make it difficult for me. He's been playing so amazingly great, and he did. I started well, but he also did. He kept hitting good shot after good shot." Henrik Stenson, finished in second place, he also had a final round of -4 under par 68, to finish the tournament on -18 under par, four shots off the pace. 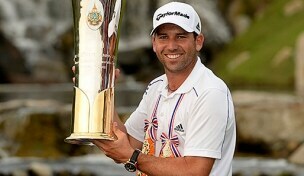 A couple of missed chances and then Sergio got away; "It was a good week. Especially because I've had a great year but coming here really on the fumes left in the tank, not too much going for me to perform this week in that sense. But I was hanging in there and I was just coming up a couple short. I needed something really, really good to happen there. I had a couple of chances to get a little bit close around 8 and 9 but I didn't make those two birdie putts and Sergio was hanging in there, made one or two good saves and then he made three birdies in a row, and then he pulled away, and then really I would need something spectacular to happen the last four or five holes." In third place was Alexander Levy of France, he shot a final round -3 under par 69 to finish at -14 under par . Last year's winner, Charl Schwartzel with had a second straight -5 under par 67, and finished in joint fourth place, along with Yuki Kono of Japan, US Open champion Justin Rose, and Anirban Lahiri of India. Best placed Thai golfer was Nirat Chapchai, tied in eighth place at -11 under par, in his effort to win his National Championship.